Finding himself stuck with an early release of Lindberg's 1961 Chevrolet Impala (the one with the mis-shapen cowl, windshield, hood and dash board) and feeling a stock build up was out of the question, Harry decided to go the custom route. And are we glad he did. 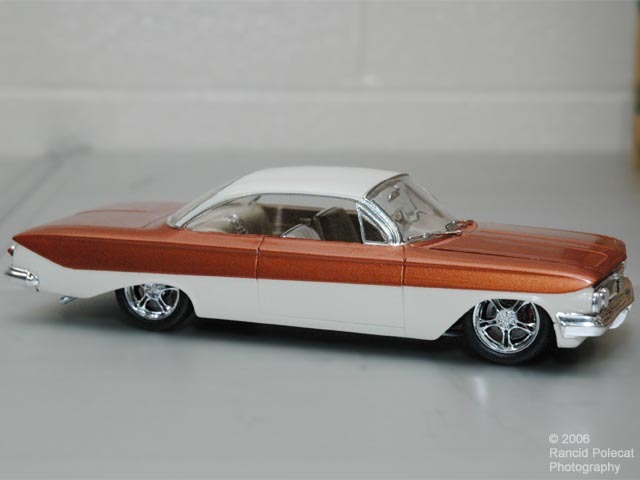 For the interior, he swapped in a set of seats and a console from a Revell 1965 Impala kit. After adjusting the seat to fit at a proper-looking height, he painted the entire interior, including stock door panels and dash in Dupli-Color Pastel Sandstone.